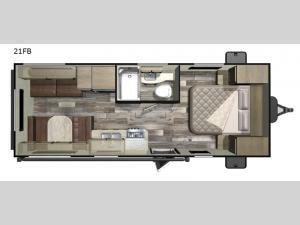 The layout of this Starcraft Mossy Oak 21FB travel trailer is conveniently set up for you to make the most of its components. If you have had an adventurous day, you can wash off at the outdoor shower before tracking it into the trailer. The stainless steel appliances make for a sleek appearance, as well as an easy clean. You will have plenty of room to whip up your best meals in the kitchen and with the double sink with a residential-style high rise faucet your clean up will be a breeze. Plus, you can store all of your delicious leftovers inside the 6 cu. ft. refrigerator. If you wish to take a hot, steamy shower after your fun filled day then you can do so in the full bathroom, and also eliminate the steam afterwards with the bathroom vent. After you're squeaky clean, head to the front queen bed with closets on either side to keep your clothes neat and tidy! Every Starcraft Mossy Oak travel trailer is comprised entirely of natural earth elements and colors to embody the outdoor lifestyle. They are built to withstand the outdoors too with their one piece seamless roof membrane that is backed by a 12-year warranty, as well as with their main floor moisture barrier material. This brand was exclusively designed for those who are passionate outdoor lovers, adventure seekers, and boundary pushers who enjoy camping. With the E-Z lube axles, the radial tires with galvanized steel wheel wells, the oversized front rock guard, and the tinted safety-glass windows you will experience a travel trailer that can withstand your adventures without falling apart on you. You will enjoy your trip to the fullest by having the convenience of home, while living in the outdoors with features like the residential-style high rise faucet, the 6 cu. ft. refrigerator, and the pleated shades. So, come pick out your perfect Starcraft Mossy Oak today!